Your neighbor denounces cellular telephones as instruments of the devil. Your niece swears that no one expects thank-you letters anymore. Your father-in-law insists that married women have to take their husbands' names. Your guests plead that asking them to commit themselves to attending your party ruins the spontaneity. Who is right? Miss Manners, of course. With all those amateurs issuing unauthorized etiquette pronouncements, aren't you glad that there is a gold standard to consult about what has really changed and what has not? 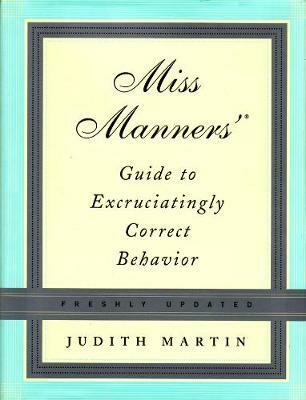 The freshly updated version of the classic bestseller includes the latest letters, essays, and illustrations, along with the laugh-out-loud wisdom of Miss Manners as she meets the new millennium of American misbehavior head-on. This wickedly witty guide rules on the challenges brought about by our ever-evolving society, once again proving that etiquette, far from being an optional extra, is the essential currency of a civilized world.